As a symbol of a couple's love and commitment to each other, the wedding band has been around for centuries. A man's choice of wedding rings is often thought of as plain and boring, but in today's world, there are many choices available! Men's bands have continued to evolve over the years and not only come in a variety of sizes and styles, but are made of different metals with many finishes. You can never go wrong with traditional gold and platinum bands that are always a true classic and stand the test of time. As an alternative, I have also seen contemporary metals such as titanium, cobalt, tungsten, and stainless steel grow in popularity due to their extreme durability and low maintenance. At Austin Private Jeweler, we will first find the band that suits you best and then as a personal touch, I can laser engrave that personal, heartfelt message for you and your significant other to share inside the ring. Our jewelry is made of 99.9% pure surgical implant quality titanium. This lightweight, yet durable metal has a silvery gray color and is hypoallergenic. Our stainless steel jewelry is made from 316L, also known as surgical steel. This is the highest grade given. Cobalt is made from the bio-friendly material that is used in hip replacements. This durable metal stays white without re-plating and is sizeable to ¼ size. Tungsten rings are forged together at 1,400 degrees Celsius to form rings that are virtually indestructible. This metal is scratch resistant and always looks permanently polished. Ceramic Couture jewelry is made of a hi-tech aerospace material. This permanently polished jewelry is lightweight, colorfast, and heat resistant. 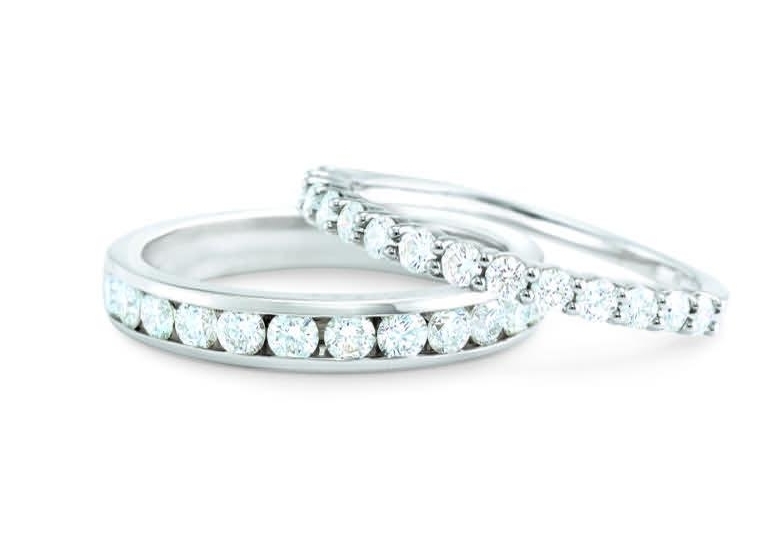 The gift of a diamond eternity band is the most cherished way to celebrate many of life’s important moments. Diamond eternity bands are not only a popular wedding band choice, but also symbolize everything from anniversaries to milestone birthdays. A diamond eternity band truly says it all. Austin Private Jeweler’s diamond band collection is filled with endless styles of unique and exclusive designs, as well as modern trends and beloved classics. Celebrating something so important deserves only the very best!